Joseph Smith is in Kirtland, Ohio. About 1000 Saints are in Jackson County, Missouri 800 miles away. The members moved to Missouri because it had been promised to them that this would be Zion. Mob violence erupts in Independence. Mobbers destroy W. W. Phelps’s printing office and scatter pages of the Book of Commandments. Bishop Edward Partridge and Charles Allen are tarred and feathered. The mob appeared again on 23 July with rifles, pistols, whips, and clubs. They searched for Church leaders, cursing and profaning as they went. They set fire to haystacks and grain fields and destroyed several homes, barns, and businesses. The mob eventually confronted six leaders of the Church who, seeing the property and lives of the Saints in jeopardy, offered their lives as a ransom. They were forced to sign an agreement to leave Jackson County. Joseph is 800 miles away but the Lord can see everything and sees the suffering of his Saints in Missouri. 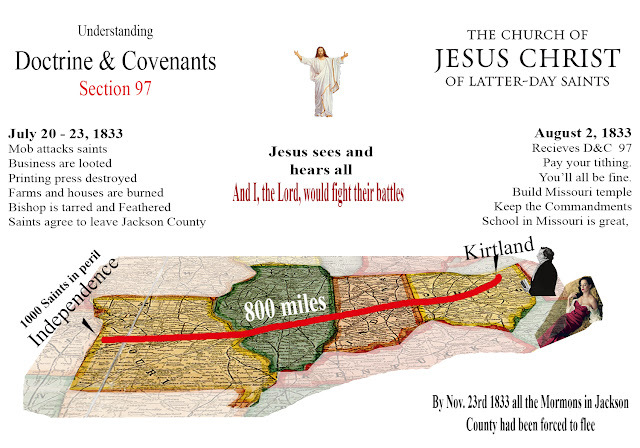 So he gives Joseph Smith a revelation. What does it tell the Prophet about those saints in Missouri? 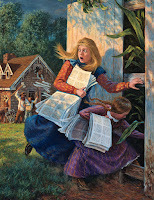 Revelation given through Joseph Smith the Prophet, at Kirtland, Ohio, August 2nd, 1833.
it will all be OK. .... if you keep the commandments. 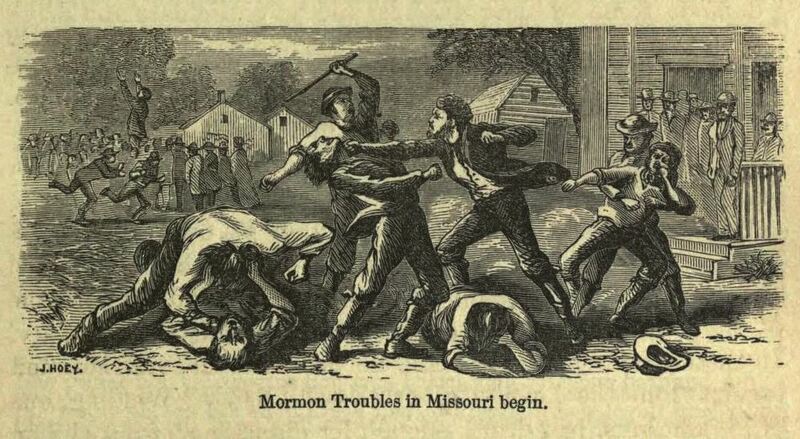 Determined to settle the matter decisively, the old settlers mobilized to drive the Mormons out. Renewed violence began on October 31, 1833, with an attack on the Whitmer Branch a few miles west of the Big Blue River, near Independence. The mob demolished houses, whipped the men, and terrorized the women and children. For a week, attacks, beatings, and depredations against the Saints continued. 3 Behold, I say unto you, concerning the school in Zion, I, the Lord, am well pleased that there should be a school in Zion, and also with my servant Parley P. Pratt, for he abideth in me. 7 The ax is laid at the root of the trees; and every tree that bringeth not forth good fruit shall be hewn down and cast into the fire. I, the Lord, have spoken it. 10 Verily I say unto you, that it is my will that a houseshould be built unto me in the land of Zion, like unto the pattern which I have given you. 21 Therefore, verily, thus saith the Lord, let Zion rejoice, for this is Zion—the pure in heart; therefore, let Zion rejoice, while all the wicked shall mourn.